Not all angels go to heaven -- the lucky ones go to the VS Fashion Show. Not all angels go to heaven -- the luckiest ones get to spread their wings in the Victoria's Secret Fashion Show. For the past 23 years, the biggest and brightest names in the modeling industry have donned elaborate wings and beautiful lingerie ensembles to strut down the runway in the Victoria’s Secret Fashion Show. (Heidi Gutman/ABC) British-born model Alexina Graham shows off her costume backstage at the 2018 Victoria's Secret Fashion Show in NYC?. The high profile fashion show returns to its original home of New York City this year, after a few years abroad. “The difference between a fashion show and VS is that it’s about the personality and about the girl,” model Shanina Shaik explained to “GMA." (Heidi Gutman/ABC) Bella Hadid gets her hair and makeup done before the 2018 Victoria's Secret Fashion Show in NYC.? With a modeling roster filled with names like Kendall Jenner, Gigi Hadid and Adriana Lima — combined with performances by The Chainsmokers, Sean Mendes and Halsey, this year is sure to be a showstopper. “Good Morning America” caught up with some of the models backstage before filming to hear about their experience walking in the show. “It’s like the Super Bowl of the modeling world,” Devon Windsor told “GMA.” The blonde has walked in the VS show five times previously. 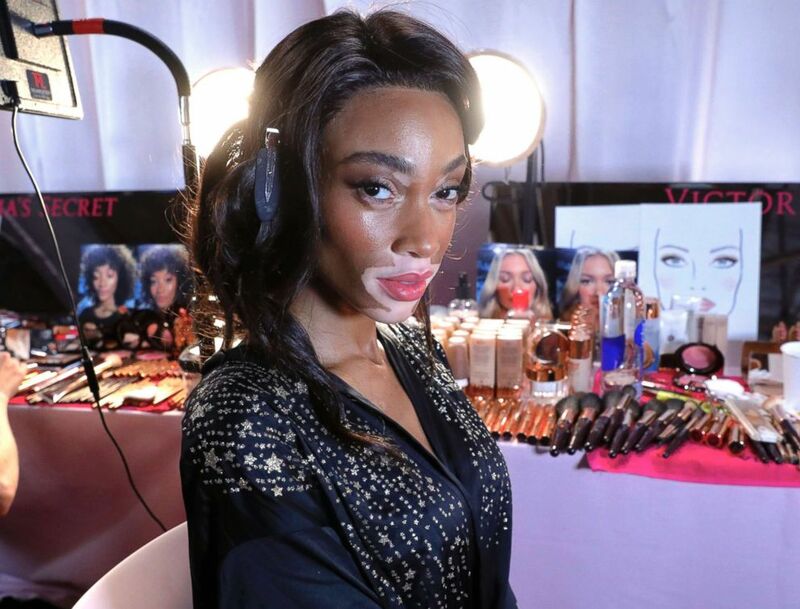 (Heidi Gutman/ABC) Model Winnie Harlow gets her hair and makeup done before the 2018 Victoria's Secret Fashion Show in NYC?. For some models, like Winnie Harlow, it’s their first time walking in the show. Harlow’s debut is groundbreaking, marking her as the first model with vitiligo to walk on the Victoria’s Secret runway. Harlow is one of 15 women of color gracing the stage this year. (Heidi Gutman/ABC) Model Sabah Koj smiles for the camera as she gets ready before the 2018 Victoria's Secret Fashion Show in NYC.? “I wouldn’t be doing it if I wasn’t empowered,” she continued. (Jeff Neira/ABC) Gigi Hadid walks down the runway at the 2018 Victoria's Secret Fashion Show in NYC. The competition for a spot in the show is fierce. Even supermodel Gigi Hadid admitted that she didn’t make it the first three times she auditioned for the show. “People think it’s this competition thing where it’s like, girls versus other girls and once you get here, I think you realize that everyone here is at the right time for themselves,” Hadid continued. For all models, walking in the show is a dream come true and signifies a new chapter in their career. “I used to have Adriana Lima on the cover of my diary and now I’m sitting here doing a show with her,” three-time veteran Georgia Fowler said. (Heidi Gutman/ABC) Elsa Hosk wears the coveted 'Million Dollar Bra' backstage at the 2018 Victoria's Secret Fashion Show in NYC. This year, Elsa Hosk got the honor of wearing the coveted Victoria’s Secret Fantasy Bra, designed by Swarovski and worth $1 million. “I’m very excited,” Hosk said about wearing the iconic, glistening piece of lingerie. Whether it’s their first year walking in the show or their 18th year, like Lima, one thing that never changes about the show is the nerves. (Jeff Neira/ABC) Adriana Lima walks down the runway at the 2018 Victoria's Secret Fashion Show in NYC?. “I thought that I would be more relaxed after so many years, but I’m still nervous and anxious,” said Lima, who first walked in the Victoria’s Secret Fashion Show in 1999. Lima, who was visibly emotional during her final walk, announced that 2018 is her last runway appearance as an Angel on the stage. Where Lima will go next is anyone’s guess, but the supermodel will always have a strong team at Victoria’s Secret supporting her every step of the way. You can watch Lima’s final walk on the runway when the Victoria’s Secret Fashion Show airs on ABC on Sunday, Dec. 2 at 10 p.m.